Pahal’s school was off and my blog had conked off so I needed some time to fix it. This led to a small experiment that has now become a pleasant habit and a sweet bond. To spare some time for my blog fixing, I handed over my not-so-favourite make up stuff to my five year old daughter. They mostly comprised of lipsticks, kohl and nail paints. I am not a make up person but I like to apply lipsticks or lip glosses (depending upon the mood and the dress), a bit of Kohl and an eye liner. I used to use nail paints but with her growing fondness of my nail colors, nail paints come to play only on special occasions. My daughter Pahal, who is not even five yet, is very fond of nail paints and tattoos. She attended her friend’s birthday where she got a water color tattoo painted on her hand. She is now ever ready with a ball pen to scribble ‘dear muma’ on to my palm or ‘dear papa’ on to her daddy’s palm. Worse is when she insists on drawing a pattern and she draws a zig zag maze with flowers on the corners of the hand and she fills the fingers with blue color as if I just dipped my fingers in blue paint. Well so that day I handed over all the barbies to her and asked her to do all the make up and grooming to the dolls. She happily spent a day fooling around with the dolls. My blog still needed some time so I emptied my make up tray again in front of her the next day and gave her the dolls as well. ‘It’s alright mumma. You keep working on the lap top. I will not disturb you. I will only apply the make up’. I tried to cajole her and convince her but she persisted. Finally, I gave in. There I sat in front of the laptop, reading support forums on Google while she applied lip gloss to my lips. She also brought a mirror for me to look at myself. I was not interested in what she did as I badly needed to work on the blog, but I praised her efforts. Little did I know that this encouragement would become her favorite hobby. Her school was still off and my blog was fixed so I decided to play with her and her make up techniques. We did this fun activity for many days in a row. We clicked pictures on few days, we skipped on many but this is a practice that still continues. Like yesterday when I went for my sixth wedding anniversary dinner, she insisted I take out few strands of hair in front of my face because she thought, ‘it makes me look cuter’ and I gladly obliged. This experiment officially began on the day she insisted on painting my toe nails. 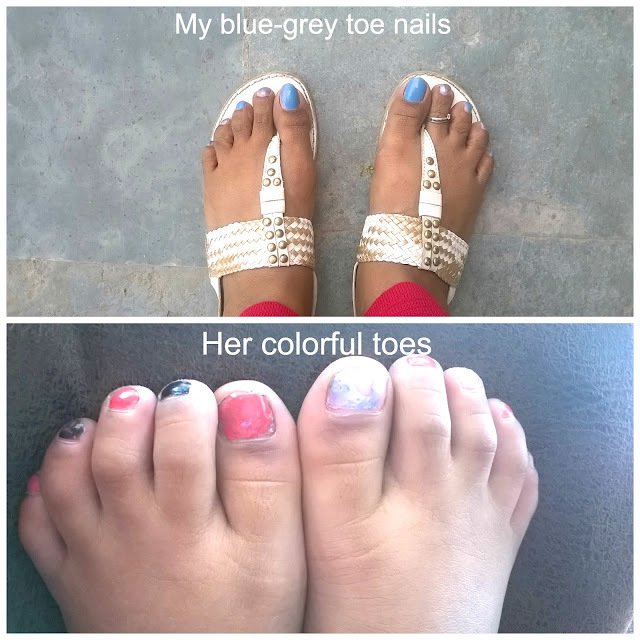 She asked me, ‘mumma dont my feet look cute?’ How could I say no? How could I call these tiny, colored feet ‘not cute’? I embraced her and from there started the journey of being groomed by my toddler that not only gave me so much pleasure at a personal, motherly level but also made me realize how much weight we women put up on ourselves in terms of body image and appearances. I went out to the market with these colorful toes and I felt happy. I was not conscious of my feet because I really thought the different colors made my feet look better and cuter. Though I wondered if someone might stare at my feet but no one gave a look. I didn’t want her to but she asked in such a malleable tone that I allowed her. Can you see the red color popping out of the right edge of the upper lip? That’s my daughter’s art. I went inside the school with the same lipstick. A woman looked at my face but that was it. I met an acquaintance on the way, we greeted each other. She smiled, noticed the lip color but she didn’t say anything about it. We bought the things, got back into the car and came home. No one had said anything about the lipstick. 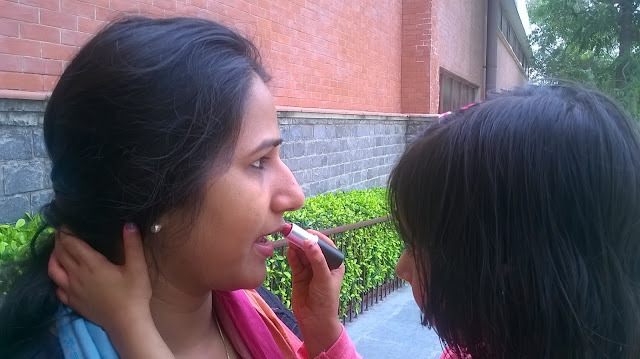 Now I was more confident of my daughter doing my makeup and myself carrying it with ease. So I looked forward to having her on board as my make up artist. This day I had to go to buy groceries. I asked her what color of lipstick would suit me today. She answered, ‘brown since you are wearing a brown tunic’. I handed my Oriflame brown lipstick to her and she gladly did her job. Just that this time she sketched it outside the lower lip. It looks like as if I have only applied the liner well below the lower lip and forgot to apply the lipstick. I went to the grocery store, interacted with the sales woman there and bought the stuff. No one said, noticed or pointed out anything. I was now totally comfortable making my face a canvas for my daughter’s artistic hands. I asked her to apply the pink eye liner. She tried but instead broke it. We let go of the eye liner (as I didn’t want to take chance with other liners) so I asked her to apply the kohl. This was the first day she applied the kohl on me. She did very well for her age though you can see the result. She painted my nails in one, single color and she applied vermillion on my forehead (a North Indian ritual). This is the over all look. As you can see the vermillion line is way longer than it should be. I generally put a small dot on my forehead right below the centre partition. My baby took it quite low on the forehead. She smudged the kohl near the inner corner of the eye which can be seen in the picture if you watch closely. Can you see the smudged kohl and the longggg vermillion line? 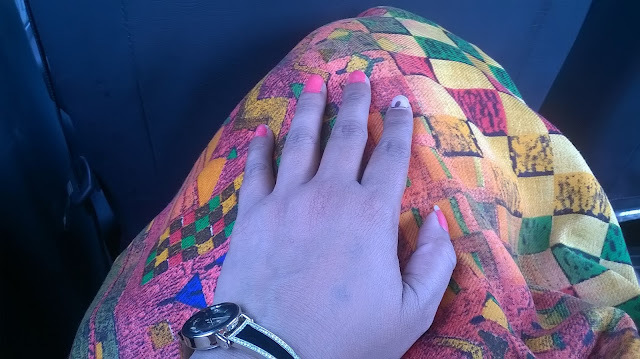 This day I went out to buy a dress for my baby from a nearby market. Again, as expected, no one noticed or said anything, let alone making fun or mocking at me. Our sessions are still going on. She sometimes dresses me up and makes my hair but I do not document it. This is not an experiment any more, it is a sweet mom-baby play time with each other. This little exercise has taught so much to me as a woman. While I roamed in the market with smudged kohl, smudged lipstick and childishly-painted nails, I was the one who noticed my own make up. No one else cared about my lipstick, kohl or the nails. No one actually cares, I feel. It is just us who unnecessarily take up so much of burden upon ourselves. We bury us in the deep pile of expectations of looking good, dressing right, perfect makeup and fit figure. This over expectation, when no one out there takes even a slight notice of these, is absolutely ridiculous. We need to stop doing this to us and to others. I had an awesome time with my daughter who was so pleased that she got to play the controller and reverse the role with her favorite person. She could control my looks, makeup and my dress. She feels accepted and loved when she asks me to do a certain thing and I willingly do it. As a girl, who would grow up to be a woman in an even more competitive world, I want her to understand that beauty standards are bull sh*t. There is only one thing called personality which comprises up of who you are as a person. Looks is just how someone sees you and that totally depends upon the other person how he or she sees you. I also want her to know that there is no set parameter of beauty or even make up for that matter. She popped out my lipstick from one corner and I still carried it. I still looked beautiful to her and I was still me. She painted my nails in different colors and it only made me a little more cheerful for some unknown reason. The only criterion of beauty is the one that we set. If we don’t set a standard, there can’t be one. I want her to accept herself fearlessly when she grows up without any prejudices, inferiorities and complexes. I wish her to become a woman confident of herself who can walk around baring her soul on her sleeve and who gives a damn to what others think about her beauty or looks. She can be what she wants to be and she can look the way she prefers to. For this, I had to set an example. I hope I did. I hope you enjoyed reading about this small experiment. Please share it by using the buttons above. Your friends will like the post too. Thanks. As An 8 Yr Old, THIS IS HOW I Fought Against Sexual Abuse Are you feeling lonely? very interesting post… i like pahal's creativity on you.. God bless her.. Cute Pahal !! I liked her creativity. Hats off to your parenting. You are building so much confidence in her. Keep going. No wonders, She will set an example to many. God Bless the little child. Hi Sandhya.. I am not sure if I am doing the right parenting because I get my doubts sometimes but I know for sure that I will make a confident woman who is comfortable in her skin. No matter what! Thank you for the comment. 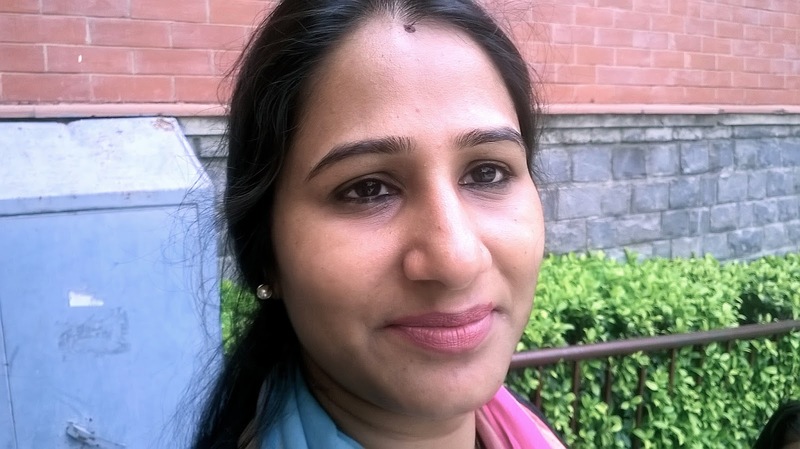 Hi Surabhi, your little blog made my day. Its so amusing to read Pahal's adventures with make-up. Sometimes I feel we get to discover the world all over again through our kids. I'm think she's gonna grow up to be an adorable, confident, creative person. Thanks to her momma. Dear Joy, thank you for the kind comment. I particularly appreciate it as it comes from a male. That's really nice of you to look into the feelings that went in writing of this post. Thanks again. Hope to see you here often. You are such a good observer of things.. The thing is that it is much better to make ur daughter happy by roaming out in her childishly applied makeup rather in well applied makeup for the glance of other people.. Love u.. I hope i can be a mother like u.
I really enjoyed your article. It takes a lot of strength to let go and put yourself in the hands of your young daughter. It sounds like a humbling experience for you – by being brave enough to step out of your comfort zone – and an empowering experience for your daughter as you showed trust in her abilities – well done! Hello Terri, thank you so much for appreciating my little experiment. This sure helped me come out of my comfort zone and minor insecurities and yes, it also helped her in realizing her power. I feel we should all take few actions that help us break the stereotypes. Thank you so much for reading. Very cute Post surbhi! Cheers to daughter n Mother's beautiful Relationship.